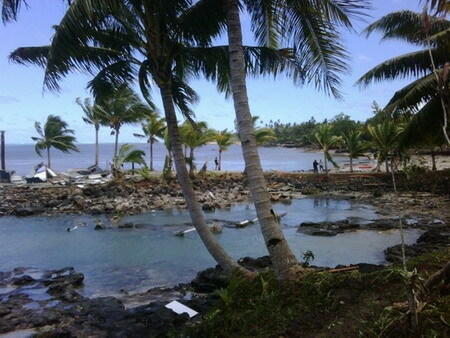 PAGO PAGO, American Samoa: A powerful Pacific Ocean earthquake spawned towering tsunami waves that swept ashore on Samoa and American Samoa early Tuesday, flattening villages, killing at least 34 people and leaving dozens of workers missing at devastated National Park Service facilities. Cars and people were swept out to sea by the fast-churning water as survivors fled to high ground, where they remained huddled hours later. Hampered by power and communications outages, officials struggled to assess the casualties and damage. The quake, with a magnitude between 8.0 and 8.3, struck around dawn about 20 miles below the ocean floor, 120 miles (190 kilometers) from American Samoa, a US territory that is home to 65,000 people, and 125 miles (200 kilometers) from Samoa.